Olivia Degn is the newest member of the Creek to Coast family. With a background in marine biology and a healthy appetite for all things Creek to Coast, Olivia is eager to dive into the deep end and start dropping some lines. Your favourite 4WD track? Ngkala bypass on Fraser Island. Best camping spot? Joshua Tree California. If you had to be stuck on an island with one of the other Creek to Coast presenters, who would it be and why? Sally Jenyns! Because she would keep us alive and healthy with her stellar seafood dishes and we’d spend 90% of the time laughing at each other. What is your funniest crew story? Scotty and I were trekking through the Vanuatu jungle when we approached a very steep, slippery incline. Our guide took three seconds to navigate the obstacle then threw his hand down to pull me up; but no one was game enough to extend a hand to the big fella. So the guide instructed Scotty to pull himself up by grabbing hold of the nearest thick tree trunk. Scotty did so… and the entire tree became uprooted, and he & the tree fell back onto the guide behind him. If you could go anywhere, where would it be and why? Madagascar! There is an insect native to the island called the Giraffe Weevil that has sparked my curiosity for years. What is your hidden talent? Mimicking bird calls! Best eating fish? Freshly caught sweetlip. Best catching fish? Spanish Mackerel! Item you always have with you for camping/driving/fishing? Water! What food do you despise the most? Olives and capsicum. Favourite recipe/food? Sand crab lasagne… or sticky date pudding. What is the most unusual bait you’ve used to catch a fish? A torn off piece of apple danish haha we caught a whiting! What is your best party trick? I have whats called a geographic tongue. The pattern on the surface of my tongue changes daily. On a day off…where would we most likely find you? Fishing with my dad. What are you most afraid of? Urghhhh spiders. I really hope the team don’t use that information against me! Your best relaxing spot? There’s a little cave inside the cliff off Moffat headland. It’s a struggle to access but an amazing little spot to watch the surf. 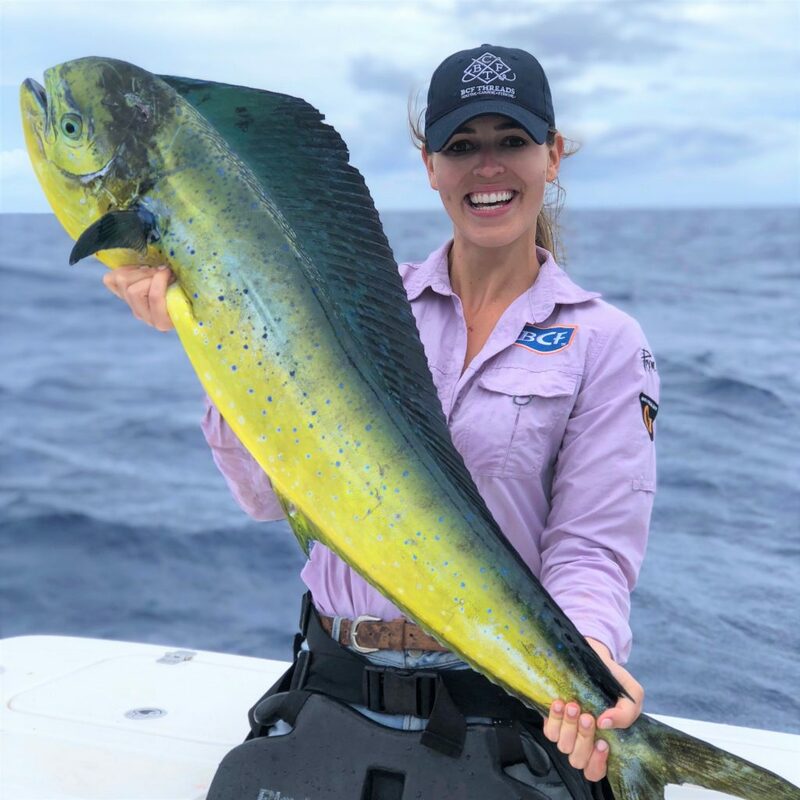 Mahi Mahi... Blue Fin Trevally... we caught it all while in Vanuatu, as well as a bit of exploring under the water too!